What style channel letter are you looking for? Here are some examples of the most common channel letters for your information. Please give us a call if you have any questions or if you are stilll confused as to what channel letter is best for you? Aluminum Backs with Acrylic Faces and Trimcap. You can choose from LED or Neon Illumination. Note: Make sure your channel letter is UL Listed. Painted any colo with Aluminum Backs; Choice of acrylic clear faces; Neon Illumination. Note: Make sure your channel letter is UL Listed. Painted any color you want, Aluminum Backs, Structural Polycarbonate Backs, Aluminum Faces; Neon or LED Illumination. Note: Make sure your channel letter is UL Listed. 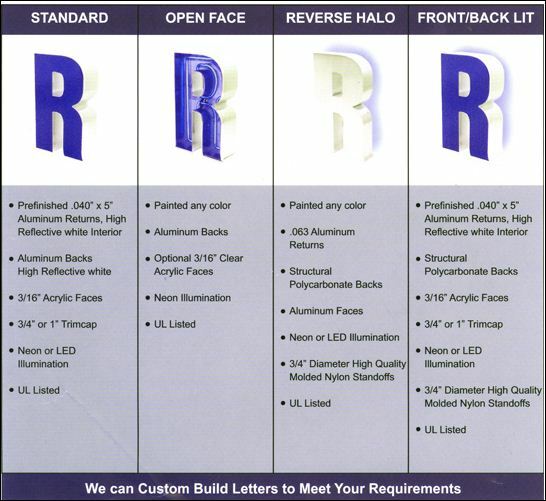 Prefinished Aluminum Returns; High Reflective White Interior; Structural Polycarbonate Backs; Acrylic Faces and Trimcap; Choice of LED or Neon Illumination. Note: Make sure your channel letter is UL Listed. SEE - EXAMPLE GUIDE TO WHAT CHANNEL LETTER IS BEST FOR YOU?